Overall Size: 31" x 23.5"
Command and General Staff College Class 09-01 selected the theme "Night Operations in Iraq or Afghanistan" based on the students' combat experiences and intellectual challenges faced at the college. While the print leans towards a depiction of Afghanistan, the themes throughout the painting showcase the obstacles that the US military faces in the Global War on Terror also known as the "Long War" in every location from Iraq to the Horn of Africa. The small unit in the foreground emphasizes the criticality of junior leaders or "strategic corporals" to execute successful counterinsurgency tactics. In the painting, this platoon-sized element occupies a building while it evacuates one of its own casualties and completes their extraction after conducting night operations. The securing of this building represents the generic "people" or population that serve as the key terrain in any insurgency. The extraction of the wounded soldier reflects not only the sacrifice of the American military, but the cohesion of our units that always take care of our own. To achieve success in counterinsurgency operations, our military has had to leverage all of its assets. This concept of joint operations incorporates everything from the Soldier on the ground to the pilots in the air to the state department representative on a provincial reconstruction team. 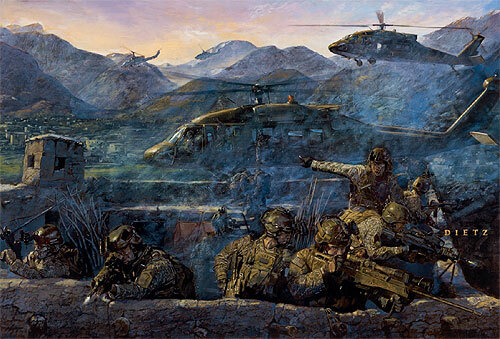 The artist's depiction of US Army Soldiers and aircraft, a US Air Force JTAC, and two Marine Cobras show the synergy of all the services and government efforts. This action occurs at night/pre-dawn which substantiates the US military's capability to operate anywhere in the world at any time of day. Finally, the servicemen in this painting exude the warrior spirit that pervades the entire US military which stands ready to do whatever our nation asks of us. We're sorry, but we cannot offer framing or framed shipping for this print, due to its size.